PhoenixMotorsport offers a wide range of lighting upgrades. Choose from high output headlamp bulbs in the new HIR (Halogen Infra-Red Reflecting) type to colourless indicator bulbs which flash orange but look chrome for that clear indicator look. 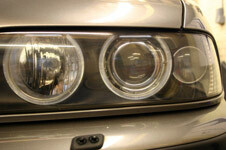 We do not currently offer the popular HID conversions as these are contrary to the current Constructions and Use Regulations in the UK unless the vehicle has automatic headlamp levelling and headlamp washers and this may shortly make these conversions both illegal, an insurance issue and an MOT test failure item. The photo to the right demonstrates the enhancement to styling a colourless bulb makes to a crystal style wing repeater/indicator. The standard wattage colourless indicator bulbs greatly enhance those vehicles which utilise the crystal clear or white indicator lenses. In these vehicles, the lamp uses an orange coloured bulb but with the reflector shining an image of this bulb outwards, so even when unlit, the indicator presents an orange glow. With our colourless bulbs, the indicator is completely clear or white until the lamp is lit, when it presents the correctly specified indicator colour. These bulbs are available in a 6 bulb kit,(2 front, 2 rear and 2 side repeater), or in individual pairs, in straight pin, offset pin and capless peanut. Your bulb fitting will need to be specified on order. 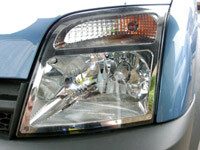 This image shows the effect of a colourless bulb in the headlamp cluster of a 2004 Ford. This is the same lamp, unlit,with a standard indicator bulb fitted. 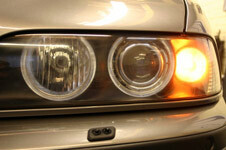 Image 1 shows a BMW 5-Series fitted with a colourless bulb. Image 2 shows the colourless bulb in operation. 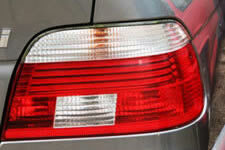 The colourless indicator bulb in image 2 clearly enhances the styling of this clear style rear lamp assembly. 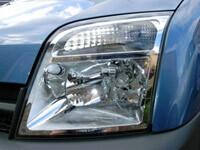 Halogen Infra-Red Reflecting headlamp bulbs are available to replace the new 9005/9006 style halogen headlamp/foglamp bulbs being fitted more and more commonly in newer vehicles. The design behind the bulb is a development made by General Electric to cover the filament of the lamp with quartz glass with an internal reflective coating to reflect heat from the filament back onto the filament to increase its operating temperature, and hence the light output. 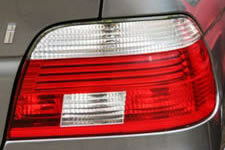 The lamps produce around 80% of the light output of an HID lamp at 20% of the cost. The actual light output increase is a very noticeable 30-35%. Additionally, the bulb draws the same current through the wiring so not overloading the vehicle electrical system as is the case with high wattage bulbs and it runs cooler, even than standard bulbs, essential for the new plastic lensed headlamp assemblies. Our HIR replacement lamps are a high quality bulb made by Toshiba. We carry a full range of standard replacement Halogen bulbs in stock in BAX95 6W sidelight, H1,H3,H4,H7,HB3(9005), and HB4(9006) fittings in standard, cool blue and xenon colours, with H1 and H3 available in 100W output for off-road use. Stoplight, taillight, sidelight and indicator bulbs are also available in most fittings, either individually or in emergency full bulb kits.